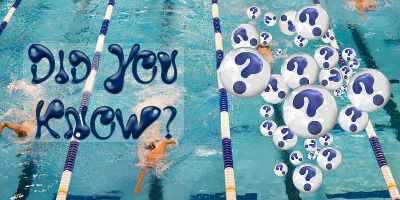 3) The breaststroke is both the oldest and the slowest form of swimming. Historical evidence has indicated that our ancestors from thousands of years ago preferred the breaststroke. This is also known to be the slowest form of swimming available, and it is the front crawl which is reported to be most popular. 4) Not everyone knows how to swim. Swimming is a skill that most people learn in childhood and adolescence, yet there are over 65% of Americans who have stated that they cannot swim. The American Association of Paediatrics suggests that children can safely take lessons from the age of one. However, some sources say that babies can start learning to swim as young as six months old, and baby and toddler swimming groups are becoming increasingly popular around the world. 5) The first swimming pool on a ship was on the Titanic! Known for its ostentatious luxury, the Titanic was a marvellous creation before its unfortunate demise. It was also the first cruise ship to have a swimming pool on board. Reserved only for first class passengers, it was an indoor pool that was even heated to room temperature. 6) An elephant swims twenty miles a day. An elephant’s trunk acts as nature’s very own snorkel, and an elephant is reported to swim around 20 miles a day on average. In comparison, Michael Phelps, one of the world's best swimmers and the most decorated Olympian of all time, is reported to have swum around 8 miles during his daily six-hour training period. 7) The tumble turn was invented in 1936 by American Tex Armstrong. Tex Armstrong invented the tumble turn when he was Adolph Keifer's coach for the 1936 Olympics. Keifer was one of the renowned swimmers ever recorded, losing only twice in 2000 competitive matches. Keifer was also the first man to swim the 100-yard backstroke in less than a minute, and he was an inventor and innovator of new products related to swimming, including the nylon swimsuit. 8) Swimmers shave to reduce drag and create hypersensitivity to the water. Often a race is won or lost by just a few tenths of a second, and every little thing can be the difference. Swimmers shave because they believe that this reduces the drag caused by body hair. The practice became popular after the 1956 Olympics when Murray Rose and Jon Hendricks decided to shave all of their body hair and went on to win gold. 9) The world record freediver can hold his breath for 22 minutes! Free divers train their body so that they can hold their breath underwater for longer, with the majority of freedivers averaging around 10 minutes. However, Stig Severinsen, a freediver from Denmark, smashed the world record with an incredible 22-minute dive. 10) Swimming is excellent for your psychological health! While we are all fully aware of the benefits of swimming on our bodies, studies have shown that swimming has positive benefits for your psychological health and wellbeing as well. It is a proven method of stress relief, it has many mood lifting properties, and regular exercise is associated with a happier, healthier and longer life.